Good surprise : there is no licence required ! You become easily the captain of your boat ! The price includes the hiring price of the boat, the canal tolls, technical support 7 days a week and also the boat driving demonstration on the departure day. If you've never been cruising before, don't worry! 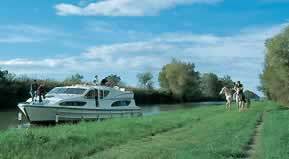 All our boats are very easy to drive and no licence is required. Every year hundreds of people discover for the first time how it's really a child's play. From 2 to 12 persons, all the boats are easy to drive and you do not need any licence. At the departure base, the staff will be at your entire disposal to explain you the functioning of the boat and will let you go only at the time yout will be sure to be ready. Going through lock is fun part of your holiday and give everyone a chance to be involved. Once you've been through your first lock, you'll see they are easy to do. Here, you can chat with other cruisers and exchange stories about your holidays. Most locks are automatic and operated by a lock keeper, many of whom keep their locks superbly tended with flowers and sell local produce including wine, local cheeses, honey and bread. The european canals and waterways that we propose are generally wide and non-tidal, meaning that the gentle currents make them easy to navigate. Some cruising region such as the Camargue are lock free, but for many people, going through the locks is part of the fun of being on the water. Most locks are automatic and virtually every lock has a lock keeper who oversees the day to day running of the locks and can offer a helping hand if you need it. 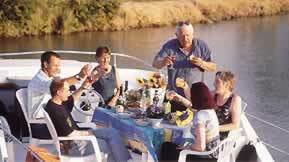 A cruising holiday is meant to be a relaxing one, with 6 to 7 km/hr being the recommended maximum speed. This means you can enjoy your surroundings at a leisurely pace and more importantly, not cause any damage to the natural habitats at the water's edge. Whenever you want to relax and unwind, simply moor up in a pitturesque spot, pour a glass of wine and watch the world go by. At night, choose to stop under the shade of a plane tree or in a modern marina where modern facilities and shore power connections are generally available for a small charge. The beauty of a cruising holiday is you get to choose. Cruising is perfect for everyone. Kids love the adventure and being first mate while adults enjoy the freedom of taking each days as it comes, just how holidays should be! For the young and the young at heart there is plenty to discover, wherever you choose to cruise.